Imperial originated Tiger Lily in the 1910-12 period as #484. In marigold the pitcher and tumblers are easily found. The pitcher comes in purple, helios, aqua, and olive. The Imperial Tiger Lily pitcher is 8 3/8 inches tall and has a 17 inch circumference. The top diameter is 5 5/8 inches and the bottom 4 5/8 inches. There is a collar base which has a design of four intaglio daisies and 28 rays that form leaf sprays. The handle is molded and has one of the four mold lines running down it. It has petal-like notches on either side of smooth panels on the outside and inside. The main design is composed of four groups of tiger lilies. Two groups have two lilies each. The other two have four lilies–two at the top and two at the bottom. On either side of the two lily sprays are sprays of daisylike flowers. The two on either side of the lip have ten blossoms while the two on either side of the handle have only eight. At the top on either side of the lip are two daisies. The tumblers have three mold lines. They stand from 4 1/4 inches to 4 1/2 inches tall depending on the flare. The top diameter is most often 3 5/8 inches while the bottom is 2 5/8 inches. The tumblers are collar based with a 24-rayed star on the underneath. 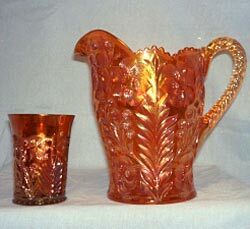 The design is similar to that of the pitcher. There are three tiger lily sprays with two flowers which alternate three daisy sprays, each with six daisies. The tiger lily sprays are on the mold lines. Tumblers also have been found in clambroth, blue, smoke, and amber. Tiger Lily water sets were reproduced in the 60s and 70s. These come in azure blue, pink, and white, and have become very collectible in their own right. A Tiger Lily variant water set was made by Riihimaki of Finland in the 20s and 30s. These have been found in marigold and blue. The pitchers come in a large and small size. The small one is 7 1/2 inches tall. The large one is 19 inches in circumference as compared to the Imperial version. In addition they rest on a ground base which has a 16-rayed hobstar underneath. The tumblers have this same design on their bases and also have a flared, ground base. They are 3 7/8 to four inches tall depending on the flare. Marigold pitchers frequently appear at most auctions not often commanding a high price or interest. Eight have been reported in the Mordini Guides selling from $50 – $250. Two undamaged purple pitchers brought $500 and $900. A damaged one brought $1,000 in 1999 and a cracked one $225 the same year. Eight helios pitchers ranged from $65 – $235. One described as teal blue brought $350. Three described variously as aqua or teal sold for $115, $450, and $700. There have been sixteen complete marigold sets listed selling from $110 – $310. Two six-piece sets brought $115 and $150 and two five-piece each $190. A seven-piece purple set sold for $900 in 1986. A purple pitcher and two tumblers were $950 in 1995. A dozen green complete sets have sold for $85 to $525. A sixpiece set made $425 in 2000. Two aqua sets sold for $2,000 in 1987 and $600 in 1998. Britt. HOACGA Educational Series – Tumblers. Doty. A Field Guide to Carnival Glass – 2d edition. Edwards-Carwile. Encyclopedia of Carnival Glass, 7th ed. Measell. Imperial Glass Encyclopedia. 3 vols. Mordini. Auction Price Reports 1986 – 2001. Thistlewood. Carnival Glass: the Magic and Mystery. Thistlewood. A Century of Carnival Glass.